There is a beautiful deer in a light-flodded clearing in the forest. 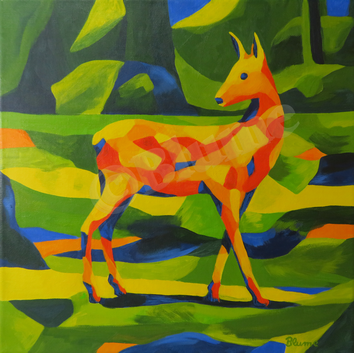 My painting of a deer called 'Beauty in the Forest'. The warm predominantly green-yellow colours witha blue and orange accentuation in some areas emphasize the warm and peaceful atmosphere. The grace and elegance of the deer is underlined by the harmony of the colours and shapes.